To my surprise the Olive Garden Roasted Butternut Squash was a dish you could order along with your meal. I always think of pasta when I think of the Olive Garden. Imagine my surprise when they were serving up roasted butternut squash. They make roast theirs with a sweet wine sauce, and it is wonderful. I am going to show you how to make this side dish just like they do. Yes, the Olive Garden serves up many wonderful dishes, their salad, their Alfredo sauce, their famous soups. Recently when I was dining at the Olive Garden you could get roasted butternut squash as a side dish. You can make this at home now, it is very easy to make. If you find it difficult to cut butternut squash I find that both Costco and Trader Joes sells butternut squash already cut up and ready to use. I recommend Riesling wine for this recipe, but honestly any sweet wine will do. I wouldn’t use an expensive white wine in this recipe, personally I would choose something under ten dollars that is drinkable. You may want to serve this dish with a roast or a roasted chicken. I love making the oven do double duty when I am roasting meat. This way I have less to clean up later. 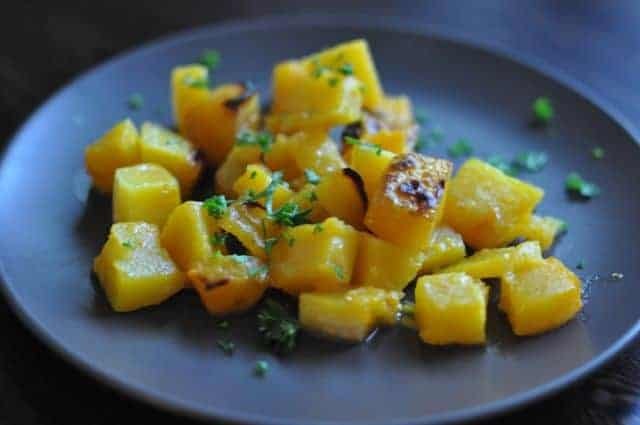 You can enjoy this butternut squash roasted just like the Olive Garden tonight. Olive Garden served roasted butternut squash a few years back. This butternut squash is flavored with sweet wine. Preheat the oven to 400°F and spray a 9 x 13-inch baking dish with cooking spray. In a bowl, toss the butternut squash with the oil and salt. Spread on a rimmed baking sheet and bake for 30 minutes. Transfer the squash pieces the prepared baking dish. Pour in the wine. Bake until the squash is tender, 15 to 20 more minutes—the smaller the squash pieces, the shorter the cooking time. One sentence in your directions is misleading. After baking squash for 30 minutes, then ” transfer squash pieces the prepared baking dish” then it states to pour in wine and bake until squash is tender. Should that transfer sentence be in there or are you using 2- 9×13 pans? Did you mean to say stir the squash pieces? Hi! I wanted to let you know that I nominated your blog for the Bouquet of Three Awards at http://marinaskitchen.wordpress.com/2013/05/12/bouquet-of-three-awards !!! Wow! I was surprised to see that a whole butternut squash only makes 1 serving. Can this be right?